It wouldn’t be fair or accurate to describe “Newsies,’’ which has arrived at the Boston Opera House for a two-week run, as just another slab of Disney cheese. Which is not to say that it’s filet mignon, either. Definitely not. Let’s call it a pretty decent hamburger. 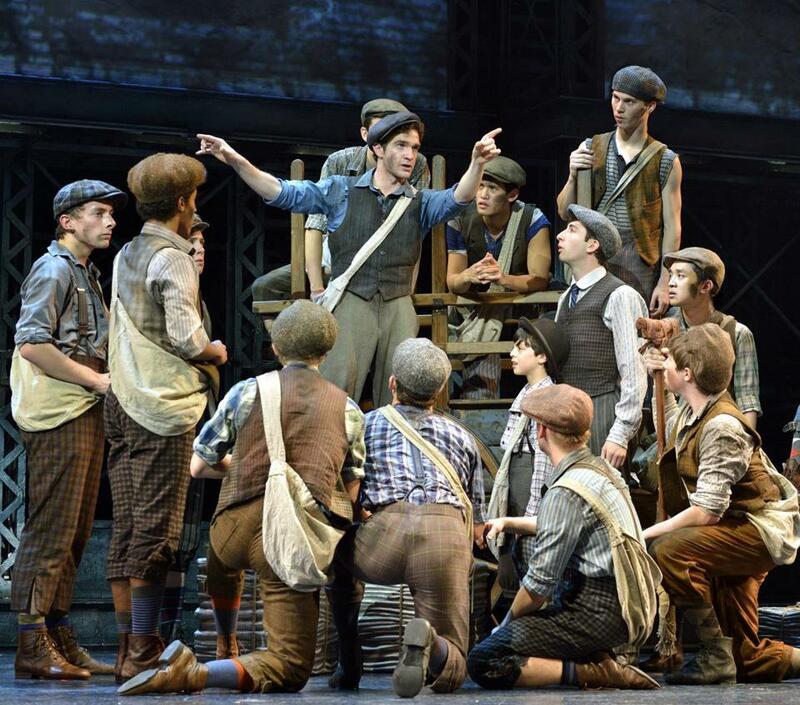 An adaptation of the movie that was a box-office flop in 1992, “Newsies’’ ran for more than two years on Broadway and earned a couple of Tony Awards in 2012. It’s easy to understand the Tony for Christopher Gattelli’s choreography. The youthful cast fills the Opera House stage with a constant surge of dynamic, athletic movement: barrel turns, split leaps, backflips, somersaults, pirouettes, and cartwheels, often climaxing with the ensemble pointing skyward or raising clenched fists high. However, the Tony for best score is harder to figure. While pleasant enough, the pop score by Alan Menken (music) and Jack Feldman (lyrics) features only a handful of distinctive songs, a couple of which get reprised in Act 2. The script is by the ubiquitous, seldom-subtle Harvey Fierstein, with direction by Jeff Calhoun. Inspired by an actual newsboy strike in 1899, “Newsies’’ is set during that year in Lower Manhattan. A collection of urchins eking out a living by selling newspapers (though their scally caps and knickers seem suspiciously fashionable), the newsies react angrily when publisher Joseph Pulitzer puts the squeeze on them by implementing a price hike. As the circulation of his newspapers starts to drop, Pulitzer sets out to crush the strikers with all the considerable means at his disposal. The leader of the newsboys is one Jack Kelly, who eventually has to make a character-defining choice: Should he accept a deal offered by Pulitzer that will keep the newsboys from further danger while also considerably benefiting himself? This is the role that made Jeremy Jordan a star, played by Dan DeLuca at the Opera House. DeLuca looks the part, and he has a bit of raffish Cagney swagger. But the actor needs to dial back the dese-dem-dose vernacular a bit. Steve Blanchard’s portrayal of Pulitzer is problematic. The bad guy in a moralistic fable like “Newsies’’ needs to project some genuine menace, but Blanchard’s Pulitzer is such a cartoon caricature of knavery that we don’t ever feel the newsboys are in serious jeopardy. The most vivid and appealing performance in this “Newsies’’ is delivered by Stephanie Styles as Katherine, a reporter who sets out to tell the story of the strike. Styles is equally persuasive in conveying Katherine’s big heart and her big ambitions. Intent on “busting out of the social pages’’ to become a hard-news reporter, Katherine can see the career-boosting possibilities of what she calls, speaking fluent tabloidese, “a ragtag gang of ragamuffins [who] want to take on the kingmakers of New York.’’ Katherine’s got a big secret, too, as it turns out. The production’s other assets include Needham’s Jacob Kemp as Davey, the brains of the newsboy operation; Zachary Sayle as a physically disabled newsboy called Crutchie; and Angela Grovey as Medda Larkin, operator of a burlesque club and ally of Jack. “Newsies’’ is not a great show, but it’s hard for this onetime paper boy and lifelong journalist not to feel some affection for a musical that puts newspapers front and center, in which one of the newsboys exults that a story about their cause is played “above the fold!’’ Further kudos to “Newsies’’ for being so unabashedly pro-union. In today’s environment, that message is practically a stop-the-presses story all by itself. Choreography, Christopher Gattelli. Set, Tobin Ost. Costumes, Jess Goldstein. Lights, Jeff Croiter. Sound, Ken Travis.